Twin full bunk bed in white or espresso finish. 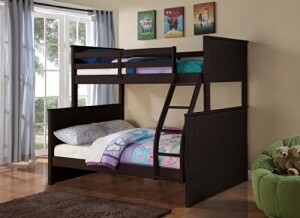 Product Features Twin Full Bunk Stackable Bunk Bed Can be converted to two beds. Fullly covered headboard and footboard 80.5″ Wide x 42.5″ – 58.5″ Deep x 68.5″ High Ships to your door by Fedex. Twin full bunk bed in white or espresso finish. Can be converted to two beds. Ships to your door by Fedex.